Please click on the red arrows to open the text under each subject heading. The “thermal efficiency” of any engine is defined as the amount of useful energy output divided by the amount of energy input . It is not a fixed quantum but varies according to the engine’s load and conditions of operation. Drawbar efficiency is defined as the the amount of energy delivered at the locomotive’s drawbar (the hook at the back of its tender) divided by the amount of energy available in the fuel placed into its firebox. Boiler efficiency can be defined as the amount of energy delivered from the boiler in the form of steam divided by the amount of energy delivered to the firebox in the form of fuel/chemical energy. Both the cylinder and drawbar efficiencies vary with speed and power output, maximum cylinder efficiency being achieved at much higher speed than maximum drawbar efficiency. This is because, as speed rises, a locomotive’s rolling resistance also rises and the tractive force avalable at its drawbar falls until, at a certain speed, the drawbar force becomes zero and thus the drawbar efficiency also becomes zero. Cylinder efficiency is calculated by dividing the work done by the steam in the cylinder by the heat drop in the cylinder. In Line 84 of FDC 1.3, Wardale calculates the isentropic cylinder efficiency of the 5AT at maximum drawbar power output to be 81%. He gets this figure by dividing the actual specific work done by the cylinder in kJ/kg (calculated from the indicator diagram) by the isentropic heat drop in the cylinder (also in kJ/kg) measured from an h-s chart (click on link to see chart and explanation). Cylinder efficiency is governed by the shape of the Indicator Diagram and in particular by the losses that are evidenced by it – most especially expansion losses, condensation losses and leakage losses. All of these features serve to increase cylinder efficiency. Limit of Cylinder Efficiency: It should be noted that even with no losses, there is an upper limit to cylinder efficiency governed by Carnot’s equation which states that the maximum theoretical efficiency of any heat engine is governed by the temperature difference between its heat source and its heat sink. Note: Isentropic efficiency is another (but very different) measure of cylinder efficiency. Instead of describing the ratio of work output to work output, it describes the ratio of work output with maximum possible work output based on steam conditions – see Thermodynamics definitions. Drawbar efficiency can be seen as the sum of the efficiencies of a locomotive’s various components. Wardale provides examples of these in his book “The Red Devil and Other Tales from the Age of Steam” where (in Table 78, page 457) he quotes figures for standard and (proposed) modified Chinese Class QJ locomotives, and where (on page 501) he suggests what might be achieved from the further development to the level of “Third Generation Steam” traction. The figures from these pages are combined in a single table below, however it is recommended that the qualifying texts from both Table 78 (page 457) and page 501 of Wardale’s book be read in association with them. Maximum drawbar thermal efficiency is usually reached at modest speed and power outputs such that increasing rolling resistance and increasing fuel carry-over (in the case of coal firing) are offset by increasing cylinder efficiency. 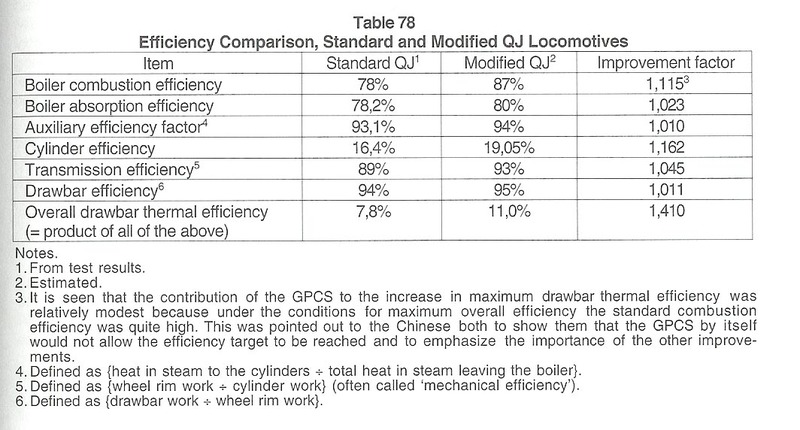 * Note: Wardale’s estimate for TGS drawbar efficiency differs significantly from the figure of 25% that he quotes as being Porta’s estimate for condensing third generation steam locomotives – see Second Generation Steam page of this website. However Wardale makes it clear (on page 501 of his book) that his figure applies to non-condensing locomotives and that “higher efficiency could only be obtained by expanding the steam to sub-atmospheric pressure and low temperature by means of condensing to counter the negative effect on the cycle efficiency of the restricted inlet steam temperature as done in stationary steam plant”. Boiler efficiency depends on the design on boiler and firebox, the type of fuel, and the draughting system. In the case of coal-fired boilers, boiler efficiency declines linearly with rate of fuel feed, as discussed on the Grate Limit and Boiler Efficiency page. The term “triangular losses” is used to describe the rounding of the corners of a locomotive’s indicator diagram caused by the opening and closing of valves, and whose effect is to reduce the area of the diagram and thus the work done by each piston stroke which in turn reduces power output and efficiency. Some of these do not represent losses of energy so much as “losses of potential”. Triangular losses are perhaps best described in Porta’s “compounding” paper published in Camden’s book “Advanced Steam Locomotive Development – Three Technical Papers” and consist of the rounded corners of a typical Indicator Diagram as compared to an “Ideal” diagram, as shown on Figure 1 of Porta’s paper as shown on the Condensation and Incomplete Expansion pages of this website. A simplied indicator diagram is shown below to illustrate triangular losses. Area C is the compression (or pre-compression) that occurs when the exhaust valve closes before the piston reaches the end of its stroke. It might be argued that Areas A and C should not be regarded as “losses” per se. Triangle A primarily represents lost potential by virtue of steam that failed to enter the cylinder because of throttling during valve closure. (An entropy rise results from the throttling process so some energy loss is involved also). Triangle C also largely represents lost potential since it is apparent that the area inside the diagram would be larger (and therefore more power gained) if the exhaust port were to stay open until the end of the piston stroke. However, since the steam is compressed elastically it returns most of the energy that it absorbs during the reverse stroke, some being lost through an increase in entropy. Notwithstanding, pre-compression offers two advantages – (a) it cushions the piston’s inertial (deceleration) forces that would otherwise have to be resisted by the connecting rod and crank pin; and (b) it builds up the cylinder pressure prior to admission and thus helps to reduce or eliminate another triangular loss that would otherwise arise at the top corner of the diagram due to a delayed rise of pressure as steam flows into the empty cylinder when the inlet valve opens. Note: The “net definite pre-admission that Porta refers to can also be referred to as “lead” as defined in the Valves and Valve Gear page of this website. What he is saying here is that the use of lead causes a small triangular loss (shown with horizontal shading). On the other hand, absense of lead (or inadequate lead) results in a much larger triangular loss (shown with vertical shading). Porta goes on to point out that the admission losses should actually include the area under the “Nominal Steam Pressure” line (indicated in yellow shading below), demonstrating the importance of (a) operating at maximum boiler pressure; (b) the use of large steam pipes, large steam chest and internal streamlining to minimize the pressure drop between boiler and cylinder. in the case of piston valves, by the use of long-travel valves that pass over the ports at higher speed, thereby reducing the time that the entry or exit of steam is throttled through a partialy opened port. use large steam chests to minimise steamchest pressure drop during admission – ideally steamchest voiume should equal cylinder volume. Note: “Losses of potential” (as described above) are real losses in the form of wasted capital rather than wasted energy. Minimizing losses in potential increases a locomotive’s performance and therefore its return on capital. Porta’s paper titled “Fundamentals of the Porta Compounding System for Steam Locomotives” addresses other associated factors that detract from a locomotive’s cylinder efficiency, including condensation/wall effects, steam leakage, clearance volume and incomplete expansion as described elsewhere on this website. More specific references to his theories on compound expansion can be found on the α Coefficient and Compound Expansion pages. Lack of steam tightness is usually imagined to be associated with steam leaking from pipe joints and piston rod glands resulting in the familiar leaks that can be seen as a white plume of steam eminating from wherever the leak is occurring. Steam leakage of this sort is indeed wasteful and deletarious to a locomotive’s performance, however much greater leakage can (and often does) occur that is not only invisible but unknown to a locomotive’s owner or operator. Invisible leakage of this sort takes place when steam leaks past valve and piston rings and escapes (unnoticed) up the chimney. The topic is discussed in some detail in two of the papers published in L.D. Porta’s “compounding” paper published in Camden’s book “Advanced Steam Locomotive Development – Three Technical Papers” including his short paper titled “Some Steam Leakage Tests on Locomotive NORA of the Ferrocarril Austral Fuegino”. Avoidance of such leakage is covered in much greater detail in his unpublished papers on Tribology and the Design of Piston Valves. Porta describes the worst offenders being locomotives with American-type Duplex rings, and quotes Chapelon under whom measurements were carried out by SNCF that showed steam leakage losses of up to 12% of the maximum boiler evaporation in the case of a very well-maintained 141R. He even mentions a figure of 20% steam loss from these locomotives, presumably in less well-maintained examples, and compares it with figures of 1.4 to 1.7% loss on the Rio Turbio Santa Fes when fitted with his design of valves and pistons, measured when the rings were life-expired. As a first approximation, leakage can be considered to be a constant volume of steam by-passing directly from the steamchest to the exhaust. It is proportional to the steamchest pressure and inversely proportional to the absolute steam temperature. But if conditions are such that the parts determining it are below the saturation temperature, its importance increases considerably because what leaks is condensate, whose density is more than a thousand-fold that of the steam. The same is obtained during the warming up period, which lasts roughly 20 minutes at full power, or may last indefinitely at low power. Poppet valves are heavy offenders where leakage is concerned. The various claims against this statement have never been sustained by measurements or serious reasoning. Chapelon measured heavy leaks as reported in his book. The reason is that except in the Caprotti gear, the valves seat on the cylinder block, itself subject to widely differing (and varying) temperatures, and hence distortions. This aspect is so important that Stumpf developed elastic seats and the corresponding theory for them. 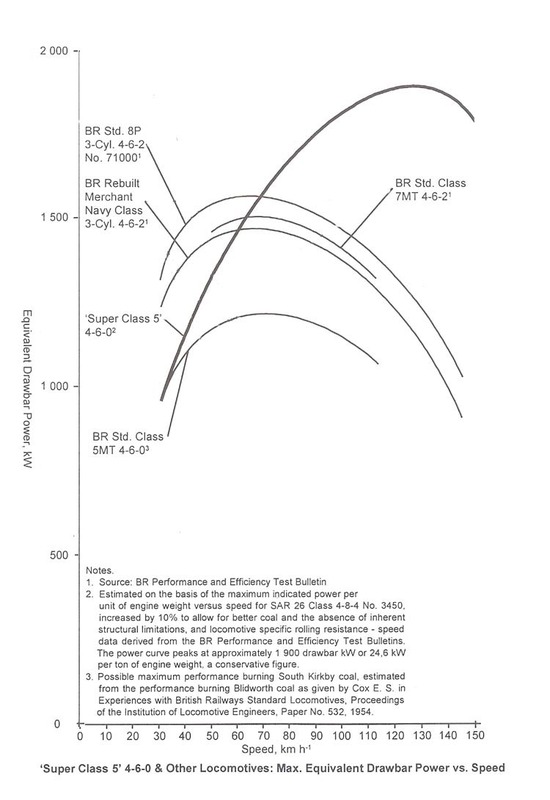 Porta’s “compounding” paper addresses other closely associated factors that detract from a locomotive’s cylinder efficiency, including clearance volume, wall effects (or condensation), incomplete expansion, and triangular losses as described elsewhere on this website. More specific references to his theories on compound expansion can be found on the α Coefficient and Compound Expansion pages. “Tractive effort” (TE) is the force applied by a locomotive for moving itself and a train. Tractive effort or tractive force is measured in kilo-Newtons (kN) or pounds force (lbf) where 1 kN = 228.4 lbf. Drawbar tractive effort – the force applied by a locomotive to the connection to its train. If the locomotive is running light (with no train) then its drawbar TE = 0. Wheel-rim tractive effort – the force applied by a locomotive to the rails through its driving wheels. The difference between Wheel-rim TE and Drawbar TE is the force required to move the locomotive in overcoming internal (mechanical), rolling and wind resistances. Indicated or Cylinder tractive effort – a hypothetical force estimated by adding to the Wheel-rim TE the force required to overcome the frictional resistance of piston against cylinder, piston-rod against gland, crosshead against slidebar and the rotational resistance of big and small-end bearings. In the case of the 5AT (FDC 1.1 lines 46 and 47), the Wheel-rim TE is estimated to be 93% of Cylinder TE at starting and 96% when running. Starting tractive effort – the pulling force exerted by a locomotive when starting from rest. The formula takes no account of piston rod diameter, which reduces the effective area of (and therefore the force applied to) the rear side of the piston. In the case of the 5AT (and a few other locomotive types) the presence of a tail-rod reduces the effective area of both sides of the piston. A locomotive’s starting tractive effort provides only an indication of the size of train that it can start. It does not measure the ability of the locomotive to pull a train at speed. This is because tractive effort reduces as speed increases. A locomotive that can maintain a high tractive effort at speed is a more “powerful” locomotive than one that cannot since Power = Tractive Force x Speed. A locomotive’s tractive effort (at all speeds) is limited by its adhesive weight and the available coefficient of adhesion between wheel and rail, as discussed on the Adhesion page of this website. The maximum speed that a locomotive can attain with any given train occurs when the locomotive’s drawbar tractive effort exactly equals the rolling resistance of the train (see the Rolling Resistance page of this website). The acceleration that a locomotive can achieve with any given train can be calculated by applying Newton’s Second Law of Motion – i.e. by subtracting the rolling resistance of the locomotive and train from the locomotive’s wheelrim tractive effort, and dividing the difference by the total mass of the locomotive and train. Power is defined as “the rate of doing work”. Common units of power in the metric system are Watts (W), kilowatts (kW), Megawatts (MW) and Gigawatts (GW), where 1 Watt = 1 Joule per second = 1 Newton-metre per second. Alternative units of measurement are calories per second and kilo-calories per hour (1 kW = 860 kcal/hr) Common imperial units of power are: Btu per second (1 Btu/s = 1.06 kW) and the Horsepower where 1 (British) hp = 0.746 kW. Power can also be defined as the multiple of force and speed, from which it can be deduced that a locomotive’s power and tractive effort (TE) are intrinsically related: Power = TE x speed. A common point of confusion in locomotive terminology is the difference between indicated power and drawbar power, the basic difference being that “indicated power” is the power developed in the cylinders, whereas “drawbar power” is the power delivered at the drawbar. These terms are defined on separate pages. The word “indicated” comes from the use of “Indicator Diagrams” that before the electronic era were mechanically plotted to indicate the variation in steam pressure inside a cylinder against the piston position as it sweeps through the piston over the length of its stroke. Separate diagrams for both ends of the cylinder were usually being plotted on the same sheet of paper. The cylinder’s power output is calculated from the area contained within the plotted curve. Thus it can be deduced that a locomotive’s power output can be increased by increasing the area contained inside the Indicator Diagram. Admission which occurs from the moment that the steam inlet port opens (near the beginning of the piston stroke) until the moment of “cut off” when it closes. At the beginning of the piston stroke, the cylinder pressure is (or should be) the same as the steam chest pressure. As the piston moves, some reduction of pressure may occur if the steam chest and/or the ports are too small. Expansion which occurs from the moment of “cut off” until the exhaust port opens (near the end of the piston stroke). During this time, the steam in the cylinder expands adiabatically (meaning no heat input) resulting in the reduction of its pressure. The relationship between pressure and swept volume can usually be estimated using the equation PVn=K, where P is the steam pressure; V is the cylinder volume (including clearance volume); n is a constant, normally assumed to be 1.3 and K is a constant. Exhaust which occurs on the return stroke between the moment the exhaust port opens until it closes again. During the exhaust phase, the cylinder pressure – or “back pressure” – is relatively constant, being governed by the steam flow through the exhaust ports and blast pipe. It can be readily seen that the area within the diagram can be dramatically increased by reducing the back pressure during the exhaust phase. This is the reason why simple modifications such as the fitting of double chimneys or Kylpor exhaust systems, result in immediate and dramatic improvement in locomotive performance. Compression which occurs between the moment that the exhaust port closes until the inlet port opens. It is clear that the area within the Indicator Diagram can be maximised by making the exhaust phase as long as possible and the compression phase as short as possible. Some compression may nevertheless be desirable, as in the case of the 5AT where it provides “cushioning” for the pistons, counteracting the inertial forces that occur at the ends of each stroke and which would otherwise cause crank-pin overstress at very high speeds. The Power-to-Weight ratio of a car is a measure of its ability to accelerate. A steam locomotive’s ability to accelerate is governed by its the ratio of its “power : total train weight” ratio and by its adhesive weight and adhesion coefficient (ignoring resistance factors). …. for high speed operation, a high Power : Weight ratio is essential. It implies the need for a small boiler, requiring highly efficient draughting, and high combustion rates, requiring an efficient combustion system. Failure to realize this means that at high speed most of a locomotive’s power is absorbed in pulling the locomotive itself. In fact any locomotive has a ‘zero drawbar power and thermal efficiency speed’ at which all its power is used to pull itself along, this speed being largely a function of its inbuilt power : weight ratio. That this ratio was not high enough in steam locomotives was the basic reason why steam was perceived as being unsuitable for the accelerated services which many railway administrations, especially in Europe, saw as essential if rail transport was to remain competitive. It was, however, only an inherent characteristic of most First Generation Steam (FGS) locomotives, not of steam traction per se. The Drawbar Power-to-Weight ratio [of No 3450, the Red Devil] based on the engine weight only (i.e. excluding the tender) was 23.0 kW/ton calculated from the maximum recorded sustained equivalent drawbar power at 74 km/h, and 24.4 kW/ton based on the predicted maximum drawbar power at 100 km/h. In respect of power capacity relative to size 3450 was therefore up to the best standards hitherto achieved despite it being a 2-cylinder simple expansion locomotive with moderate boiler pressure burning mediocre quality coal, this last factor being of great significance as very high power output from steam locomotives generally depended on burning high grade coal. Yet no-one should imagine that it represented a perform­ance ceiling for the classical Stephensonian steam locomotive. Porta’s Second Generation Steam 2-10-0 proposal was designed to give a rated Drawbar Power-toWeight ratio of 32.5 kW/ton, and even with simple expansion 29 kW/ton should have been possible for a medium-speed machine if st­arting the design with a clean sheet of paper. The predicted Drawbar Power-to-Weight ratio for the 5AT compared well with the above figures. With a maximum sustainable drawbar power at constant speed on level tangent track (and trailing a high capacity tender) of 1890 kW and an engine weight of 80 tons, its Drawbar Power-to-Weight ratio would have been 23.6 kW/ton. Specific Steam Consumption is defined as the steam consumed by a locomotive’s cylinders per unit output of power. It is typically measured in kg/kWh or kg/KJ. Thus for any given boiler output, a locomotive’s power can be increased by reducing its specific steam consumption – in particular, by increasing its cylinder efficiency and reducing steam leakage. Or as Porta put it, “the power is limited by [the amount of steam supplied by] the boiler, while the function of the cylinders is to extract the maximum work from the steam supplied”. “In steam locomotives, one should note that all the losses, except for incomplete expansion, are approximately constant for a given rotational speed. Hence, the aim is to have a longer cut-off but, given that this steeply increases the incomplete expansion losses, a compromise results at 20% to 30% (15% to 20% for the author’s proposals). Thus, the claims for poppet valves concerning their ability to work with very short cut-offs are illusory as they do not lead to low specific steam consumption because of these constant losses. “The operating variables of any locomotive working with the throttle full open can be defined, for a fully warmed up condition, by (any) two of them. For example: tractive effort vs. speed; steam production vs. speed; cut off vs. speed, etc. In Fig. 32A, for example, the constant cut-off lines have been plotted on a TE vs. Speed diagram. There is a line corresponding to the maximum cut-off, and various lines for the various running cut-offs. As a first approximation, they are straight lines whose inclination is greater, the greater the imperfection of the internal streamlining. In ordinary locomotives in which the internal streamlining is poor, the lines have an envelope: no combination of speed and cut-offs make it possible to invade the zone M (Fig. 32B). Notes on Fig 32: In Fig. 32A, Straight lines (1) are constant cut-off lines, (2) being the one corresponding to full gear. The various hyperbola-like lines (3) correspond to constant evapora­tion. Selecting one of them, such as (4) allows the provision of a def­inite boiler size. The hatched area (R) corresponding to the overload concept. Curves (5) refer to constant specific consumption, the hatched area (6) indicating the combination of speed-tractive effort in which the consumption is at a minimum. Area (7) refers to low speed, low tractive effort characteristic of shunting services. So far, the above refers to engines designed with good internal streamlining (a RARE case indeed!). Fig 32B is the common case in which the cut-off lines are so much inclined that they have an envelope (8): this corresponds to the American concept of “capacity power”; no combination of speed and tractive effort allows getting into the M region. Within the envelope area, the specific steam consumption is very high: this explains the huge size of American boilers and tenders. In the Fundamental Design Calculations for the 5AT (see FDC 1.3), Wardale gives figures of minimum indicated Specific Steam Consumption for the Duke of Gloucester as 12.2 lb/hp-h and for the SNCF 141P Class 4-cyl. compound 2-8-2 as 11.2 lb/hp-hr, as compared to 11.24 lb/hp-h (= 5.1 kg/hp-hr or 1.9 kg/MJ) for the 5AT. As discussed on the Grate Limit page, the grate limit occurs when any increase in the rate of fuel delivery produces no increase in evaporation. In other words it represents the maximum rate of heat emission that a firebox can deliver beyond which point any additional fuel added to the firebox produces no additional steam. The Front End Limit is a draughting limitation. In his paper titled “Two Point Four Pounds per Ton and The Railway Revolution“, Doug Landau defines the Front End Limit as occurring when the available excess air falls below about 20% [i.e. when] complete combustion can no longer be achieved. If this occurs prematurely, the locomotive concerned would be deemed a ‘poor steamer’. It could also be set by the designer at a value that would provide adequate steam, while at the same time avoiding ‘uneconomic’ combustion rates. The BR Standard locomotives were designed on this basis. Discharge Limit: This is also sometimes described as the ‘Front End Limit’, but it is quite different to the condition described above. It occurs when the steam exhaust velocity reaches the speed of sound. At this point theory has it that the pressure/draught relationship breaks down. Curiously however, there are recorded instances of this limit being exceeded without apparent distress. It does however involve very high back pressures upwards of 14 lbs/sq.in., and was definitely something best avoided. The term “Simple Expansion” refers to the single use of steam in powering a steam engine. “Compound Expansion” refers to the multiple uses of steam in powering a steam engine. In a “simple” engine, the steam enters the cylinder at high pressure, expands as it pushes the piston through its stroke, and is then exhausted to atmosphere as the piston returns, whereas in a “compound” engine, the exhausted steam is reused in a second “low pressure” cylinder where it expands further as it pushes the low pressure piston through its stroke. In the case of a double expansion compound, the steam will then exhausted to atmosphere. In a triple-expansion compound (mostly used in marine applications) the steam is reused again in a third (even lower pressure) cylinder. In a compound engine, the steam will pass from the high pressure cylinder into a “receiver” (a pipe or pressure vessel of adequate volume) before being admitted into the low pressure cylinder. In some cases, the receiver will incorporate means of re-superheating the steam to raise its temperature to minimize the risk of condensation. In historical texts, proponents of compound expansion are reputed to have claimed that greater use is made of the steam by expanding it twice (or more) thereby increasing the work it does and the efficiency achieved, whereas proponent of simple expansion are reputed to have claimed that the simplicity and lower cost of simple engines outweight the efficiency gains offered by compound expansion. http://hubpages.com/hub/10-Advantages-of-Compound-Steam-Engine lists ten (easy-to-understand) advantages of compound expansion. Porta’s “Fundamentals of the Porta Compound System for Steam Locomotives” gives greater technical insight as explained further in the Compound Expansion page of this website. The ability of compound engines to operate efficiently at longer cut-offs increases their α-coefficient and thus their power-to-weight ratio. Reduced temperature differentials between steam entering and leaving a cylinder, minimizes heat losses and reduces or eliminates condensation, especially where the low-pressure steam is re-superheated. Wardale believes that for a high-speed locomotive such as the 5AT simple expansion – using all the cylinder refinements that are now possible, but which are not common knowledge – is the right choice, and that the 5AT will define ‘state of the art’ for 2-cylinder simple locomotives and may serve as a reference level to which the performance of all other types of locomotive (including compounds) can be compared. Such improvement in thermal efficiency that might be gained by compound expansion cannot guarantee to justify the extra design complexity and higher manufacturing costs involved. The steam chest (or steamchest) is the “reservoir” for collection of steam as it passes between the superheater header and the inlet port to the cylinder. The advantage of a large steam chest (as is the advantage of any reservoir) is that fluctions in pressure as the steam passes from the steamchest into the cylinder are reduced. The higher the steamchest pressure, the greater the quantity of steam that can be delivered to the cylinder while the inlet port is open, and the higher the cylinder pressure at the point of cut-off. Maximizing cylinder pressure at the point of cut-off serves to maximize the work done by the steam on the piston. In alternative words, it serves to maximize the area within the indicator diagram. Ideally, the steamchest volume should equal (or exceed) the cylinder volume, but never came near this in FGS locomotives. One of the modifications that Wardale made in developing The Red Devil was enlargement of the steam chests which are easily visible on the photo below. In fact, the extent of the enlargement was limited by other constraints such that their volume increased only from 33.2% of cylinder volume to just 35.5% compared to an ideal minimum of 100%. By contrast, the 5AT steam chest volume is almost exactly 100% – see line  of FDC 6. “Such was the benefit of the Schmidt type superheater realized in actual service that it must rank as the twentieth century’s most important single contribution to the art of steam locomotive design. Yet as with the exhaust system and feedwater heating, superheating was rarely fully exploited. The superheat temperature should have been the maximum possible – full stop – and this should have been all the motivation that was needed to improve the factors such as valve and cylinder lubrication which were said to be limiting it. Superheater elements are connected to a superheater header – a small steam reservoir that is separated into two chambers. One end of each superheater element is connected to one of these chambers, and the other end to the second chamber. Saturated steam from the boiler enters the “saturated steam chamber” from where it passes through any one of the superheater elements and thence back into the second “superheated steam chamber” of the header. From there is passes through steam pipes to the steam chests and thence to the cylinders. An alternative view, copied from a 1930s children’s book, shows the main steam pipe that delivers saturated steam to the superheater header. [Of interest is the steam collection pipe at the highest point of the domeless Belpaire (LMS) boiler.] Click on image to see full-size enlargement. 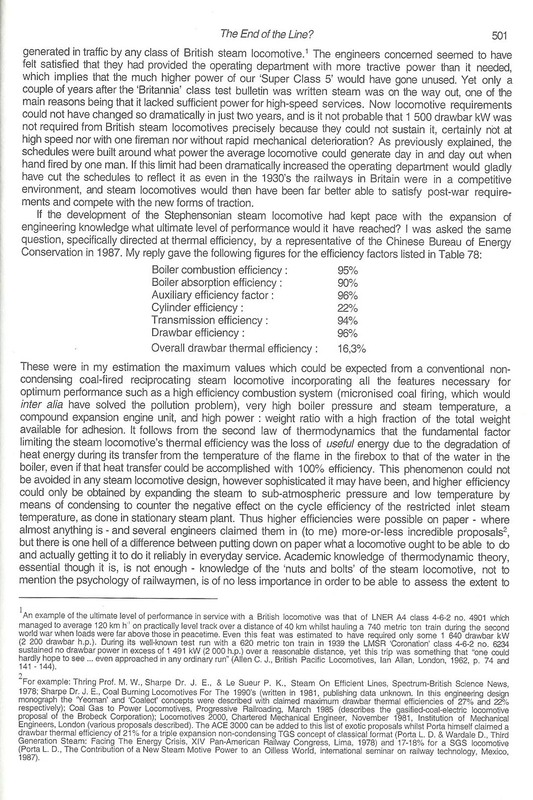 Note: In relation to the application of Feedwater Heating to “The Red Devil“, Wardale points out that “the need to increase the superheat on the modified 25NC was clear: not only was the existing steam temperature too low but the use of a feedwater heater always decreased the superheat and this factor had to be compensated for”. This non-intuitive observation is explained in a footnote to a transcription of the text from the book which is summarized as follows: “Since less heat needs to be generated in the firebox to boil preheated water, then there’ll be less heat available for superheating the steam that is generated”. Combustion Air is the air drawn through the firebox by the draughting system which allows combustion to take place. Only the oxygen content of the air (approx 18%) is used in the combustion process, the remainder (mostly nitrogen) being inert and serving no function other than wasting energy and cooling the fire. Secondary Combustion Air which is drawn in over the top of the fire – e.g. through the firehole door. Essentially, the primary air releases heat from the fuel and the secondary combustion air releases heat from volatile gases released from the hot coal in the firebed. The chemical reactions that release heat from the fuel are sometimes complex, but the end-product is a combination of carbon dioxide gas and water vapour mixed with small quantities of carbon monoxide and oxides of other impurities (plus large volumes of nitrogen). These reaction products are termed Combustion Gases. The quantity of combustion gases released from the firebox can be much larger than the volume of steam exhausted from the cylinders. For instance at the 5AT’s maximum designed drawbar power (1800 kW at 113 km/h), Wardale calculated that the mass of combustion gas ejected through the chimney would be 2.2 times the mass of steam passing through the blast nozzles. In normal steam locomotive operation, the bulk of combustion air is drawn through the ashpan and grate, thus being classified as “primary air”. Secondary air is normally only available when the firehole door is opened, usually for firing and occasionally for more extended periods to burn off volatile material and thus reduce smoke emissions. The Gas Producer Combustion System (GPCS), as described elsewhere on this website, involves a continuous flow of secondary air, usually through ducts passing through the outer and inner firebox sides and crown, and corresponding reduction in primary air. To reduce temperature drop in the firebox, it is possible to preheat the air before it is mixed with the fuel, however the first time this advance was ever implemented in practice was by David Wardale in the development of a modernized design of the QJ 2-10-2 freight locomotive. Wardale never complete the final design for this machine, but one locomotive – QJ No 8001 – was modified by being fitted with an experimental heat exchanger for the heating combustion air. The photo below of the modified machine has been copied from Hugh Odom’s Ultimate Steam website. A steam locomotive’s exhaust system is perhaps the most innovative of all the ideas that underpin the “Stephensonian” concept. It’s cleverness derives from its automation whereby the draught that provides the oxygen to generate heat from the fire is automatically governed by the work that the engine is doing. The harder it steams, the greater the exhaust and thus the greater the draught and greater the heat produced. In most First Generation Steam (FGS) locomotives, the exhaust system was developed largely through rule of thumb with very little application of scientific or engineer theory. Exhaust steam from the cylinders passes through passages (usually cast into the smokebox saddle) which meet below a blast nozzle through which the steam is ejected upwards through a “petticoat” mounted under the chimney, the petticoat acting as a venturi that creates a partial vacuum inside the smokebox that draws combustion gases from the firebox and mixes it with the exhausting steam. The size of blast nozzle and the geometric arrangement of the nozzle and petticoat were critical in obtaining a good draught and therefore good steaming – a smaller nozzle causing greater exhaust pressure which creates a greater blast and thus a greater vacuum and draught. A typical FGS arrangement is shown in the cut-away drawing below copied from a 1930s children’s book. Click on image to see full-size enlargement. Improving a locomotive’s steaming by reducing its blast pipe diameter and thereby increasing its exhaust pressure, has a very serious and measurable effect on a locomotive’s power output. Conversely, fitting an improved exhaust system that maintains smokebox vacuum when using of a larger blastpipe orifice, can significantly boost a locomotive’s power output or reduce its fuel and water consumption at a given power output. The benefit derived from an improved exhaust with enlarged blastpipe can readily be seen by inspecting a typical indicator diagram and bearing in mind that the area contained within its curve represents the power delivered by the cylinder. The hypothical (simplified) diagram below, plotted using an Excel spreadsheet, illustrates a 14% increase in power output resulting from a reduction in exhaust pressure from 75 kPa (10.9 psi) down to 25 kPa (3.6 psi). During the 1950s, the double chimney was seen in Britain to be a major technological advance bringing significant performance improvements to older designs such as the Kings and Castles from the GWR. The basic aim was to increase the blast pipe nozzle area through the use of two nozzles each exhausting through its own petticoat venturi, thereby reducing cylinder back pressure and increasing power output without loss of draught (or alternatively, increasing draught without loss of power). Unfortunately, it seems that when exhaust system improvements were being planned for post-war locomotives in the UK, too little attention was paid to earlier developments that had taken place in France where in 1926 André Chapelon had developed a much more sophisticated and scientifically-based exhaust system design that he called the “Kylchap” in recognition of a Finnish engineer by the name of Kyösti Kylälä on whose ideas Chapelon had based his design. In fact, in 1938 Gresley fitted Kylchap exhausts to four of his then new A4 locomotives, one of which (Mallard) demonstrated its superiority by achieving the world speed record for steam. Presumably it was the financial constraints of the notoriously cash-starved LNER that deterred the widespread fitting of Kychap exhausts to other members of the class until the 1950s, by when they had become part of BR’s fleet. It is to be regretted that Kylchap exhausts were not more widely used since the performance benefits and fuel cost savings that they offered must have outweighed their capital cost many times over. For further discussion of modern steam exhaust systems, including the Kylchap, Kylpor and Lempor, see the Exhaust Systems page of this website under Principles of Modern Steam. A theoretical minimum amount of oxygen is needed to react with the combustible elements (mainly carbon and hydrogen) in a given quantity and type of fuel. In practice an additional (or excess) quantity of air is required to ensure adequate contact between fuel and oxygen to guarantee efficient combustion. There are no hard-and-fast rules defining the amount of excess air that is required in any given situation, but 20% is a generally accepted minimum. For instance, in his paper “Two Point Four Pounds per Ton and The Railway Revolution“, Doug Landau defines the Front End Limit as occurring “when the available excess air falls below about 20% [i.e. when] complete combustion can no longer be achieved”. The quantity of air – and therefore the quantity of excess air – passing through the firebox is governed by the smokebox vacuum and the flow resistance through the ashpan, firebox and boiler tubes/flues. Thus the quantity of excess air passing through the firebed is dependent on the smokebox vacuum and therefore the exhaust system performance. In the normal situation, where 100% of combustion air passes through the firebed, increasing the excess air is likely to result in fuel loss caused by the entrainment of coal particles that are carried away with the combustion gases. However where GPCS is applied, only a small proportion of the combustion air (perhaps 30%) passes through the firebed, thereby allowing much higher levels of excess air to be applied. Fig 27 from Wardale’s book “The Red Devil and Other Tales from the Age of Steam” illustrates the reduction in fuel carry-over that can be achieved with GPCS, from which the possibilities for increased airflow may be deduced. Adhesion is the frictional resistance that prevents a locomotive’s driving wheels from slipping on the rail. Available adhesion depends on the conditions of both the rail and the wheel. With a clean dry wheel running on a clean dry rail the “frictional coefficient” between them may be as high as 0.35 or 35%. The presence of oil and other contaminents may reduce it to near zero. Adhesive Weight is that part of a locomotive’s weight that is supported by its driving wheels. In the case of modern Bo-Bo and Co-Co diesels and electrics, 100% of their weight is supported by their driving (or driven) wheels which allows them to deliver a very large starting Tractive Effort. The same applies to 0-6-0T steam engine, however with 0-6-0 tender engines, perhaps no more than 70% of its total weight may be supported by its drivers. The greater the number of carrying wheels, the less weight is available for adhesion, and in the case of a typical Pacific locomotive less than 50% of total weight may be available for adhesion. This has serious consequences in terms of limiting the locomotive’s wheel-rim tractive effort and its drawbar power. Coefficient of Friction is defined as the frictional resistance between two bodies and the “normal” force applied between them. In the case of a locomotive, the Frictional Coefficient = available frictional resistance ÷ adhesive weight on the driving wheels. Adhesion Factor is the inverse of Friction Coefficient, i.e. Adhesion Factor = adhesive weight on the driving wheels ÷ available frictional resistance. Frictional Coefficient between Wheels and Rail: A clean dry wheel on a clean dry rail may have a coefficient of friction as high as 0.35 or 35% at zero speed. This can drop to 0.25 in wet conditions, and very much lower if the rail is contaminated with lubricating substances such as ice, oil and leaves. Estimating a locomotive’s adhesion limit is further complicated by the fact that its wheel-rim tractive effort varies considerably over each wheel revolution, even at high speed. As a result, momentary slipping can occur where the tractive force peaks and this can, in unfavourable circumstances, initiate full-scale slip at low and high speeds. For further information, see the Advanced Adhesion page in the Principles of Modern Steam section of this website. A locomotive’s tractive force is required to overcome the resistance to motion of both locomotive and train. When the tractive force is greater than the resistance, then the train will accelerate in accordance with Newton’s law of motion: Force = Mass x Acceleration or Acceleration = Force ÷ Mass. If the tractive force is equal to the resistance, then the train will travel at constant speed. If the tractive force is less than the resistance, then the train will slow down. There are various forms of resistance that need to be considered. Rail curvature resistance applies only to curved track – being proportional to the curvature of the track (or inversely proportional to the radius of curvature). Rail curvature resistance – being proportional to the curvature of the track (or inversely proportional to the radius of curvature), but applying only to the length of train on the curved track. In addition, inertial resistance has also to be considered (e.g. when a train is being accelerated). The term “specific resistance” means the resisting force per tonne of (train) weight. It is pertinent to note that the specific resistance of empty freight trains and of passenger trains is much higher than that of loaded freight trains. This is largely because the wind resistance of an empty or lightly loaded train is the same as or higher (see below) than that of a full train. Since the wind resistance becomes dominant at higher speeds, the total resistance per tonne of train weight becomes higher. In the case of open-topped wagons, the wind resistance of empty wagons is higher than of full wagons because of the increased in air turbulence inside and around the empty wagon bodies. This is illustrated in the graphs at the bottom of this page. It might also be mentioned that wind resistance is higher when the wind comes from an angle to the direction of the train than when the wind is directly head-on to the train. This is because the wind has more impact on the ends of each wagon or carriage than when the wind is directly in front of the train where slipstreaming from one wagon or carriage to the next reduces drag. Train resistance can be measured by the force in the coupling connecting the locomotive to its train (e.g. using a dynamometer car, or in latter days using an electronic load cell). Locomotive rolling resistance is harder to measure. There are no exact methods for estimating locomotive or train resistance and reliance has to be placed on empirical formulae based on measured values. Almost every country’s railway has its own formulae for estimating rolling resistance, all (presumably) being based on recorded measurements. a term proportional to the square of the train speed representing wind resistance. Koffman’s formula for BR carriages as used by Wardale in FDC 1.1. It will be readily seen that (as explained above) the specific resistance of empty wagons is much higher than that of full wagons and that for BR Carriages is also high by comparison with loaded wagons (due to their relatively light loaded weight). On the other hand the majority of formulae give very similar estimates for the specific rolling resistance of full wagons, with the exception of the (unnamed) Australian mineral railway figures which show much lower figures. This is probably because the wagons are much larger and more heavily loaded than those in the other countries listed. Carriage rolling resistance: R = (1.1 + 0.021v + 0.000175v2) kg/tonne – from Koffman applying to BR coaches. where R is the specific rolling resistance in N/Tonne of weight and v = speed in km/h. In FDC 1.3 line 164, Wardale quotes Koffman to assume a specific starting resistance on level tangent track for roller bearing stock of 7.0 kg/tonne (= 6.99 N/kN). In FDC 1.3 line 166, Wardale uses a figure of 100 N/tonne (=10.2 N/kN) for the specific starting resistance for a locomotive. Rad = curved track radius in metres. Lt = length of train in metres. Chapter 2.1 of AREMA (American Railway Engineering and Maintenence-of-Way Association) Manaul for Railway Engineering, dated 1999 and titled “Resistance to Movement” provides data and formulae used by Canadian National Railways. The document can be downloaded from this website by clicking here. The linear inertial forces caused by the backward-and-forward acceleration/deceleration of the motion components (especially the heavy drive components) can cause an uncomfortable “to-ing and fro-ing” sensation in locomotive and train. This can be partially counteracted by the application of eccentric masses on the rims of the locomotive’s driving wheels. It is these unbalanced rotating masses that cause the dynamic augment or “hammer blow” that have made steam locomotives (often unfairly) notorious for damaging railway track. This topic is discussed in more detail in the Dynamic Augment or Hammer Blow page of this website. Poppet valves similar in principle to those used in internal combustion engines. “Valve gear” is the mechanism used to move the valve system that opens and closes the inlet and exhaust ports that let steam into and out of a locomotive’s cylinders. Stephenson’s valve gear was not invented by George Stephenson but by two of Robert Stephenson’s employees, William Howe and William Williams (see http://www.timewarp.demon.co.uk/ned/howebiog.html). It was first applied by Robert Stephenson & Sons in 1842 and took its name from the company and not the man. Stephenson’s valve gear was extensively used worldwide throughout the 19th century and through the first half of the 20th Century on Great Western Railway 2-cylinder locomotives. It is normally driven from “eccentrics” mounted on one of the drive axles and located inside the loco’s frames. One advantage of Stephenson’s valve gear is its variable lead which reduces at longer cut-offs and vice versa. See Wikipedia article for more details. Walschaerts (no apostophe) valve gear invented by Belgian railway engineer Egide Walschaerts in 1844, gained near-universal acceptance in the early 20th century. It is commonly externally mounted and driven by an eccentric crank mounted on the end of the locomotive crank-pin. Walshaerts valve gear gives constrant lead, though this is true only in linear terms – see discussion. See Wikipedia article for more details of the valve gear and an excellent animation. Baker and Southern valve gear are US designs based on Walschaerts principles, but using a complex arrangement of levers and rocking shafts to replace the Walschaerts expansion link. Caprotti valve gear invented by Arturo Caprotti, an Italian engineer, and gained some popularity in mid-20th century European locomotive designs. Caprotti valve gear uses a rotary-drive from a gearbox mounted at the end of an eccentric crank on the end of the locomotive crank-pin. (See Wikipedia article for more information). Valve ports are the slotted openings cast or cut into the circumference of each valve liner or sleeve at each end of the steam chest, though which high pressure steam passes on its way to the cylinder, and through which low pressure steam passes from the cylinder on its way to the blast pipe. At each end of the steam chest, a single port consisting of several adjacent slots (marked A in the illustration below) carries both admission steam from the steam chest to the cylinder and exhaust steam from the cylinder to atmosphere. The valve slides back and forth along the machined surface between tapered edges C and D. The slots marked B are openings that allow exhaust steam to pass through the sleeve and into the exhaust passages leading to the blastpipe. Closure when the valve closes the port to prevent further release of exhaust steam. Steam compression during which period the steam remaining in the cylinder after the exhaust valve closes is compressed by the piston as it approaches the end of its stroke. The timing of each valve event can be defined either by the percentage of piston travel or by the crank rotation angle at which they occur. “Perform” and “Perwal” simulation software packages created by Prof Bill Hall and downloadable from this website; these packages not only simulate the valve gear operation, but engine performance as well. Valve gear simulation spreadsheets (one for Walschaerts simulation, the other for Stephensons) by Don Ashton and downloadable from his website. Several programs created by Charles Dockstader and downloadable from his website. Charles Dockstader’s website also includes a program for constructing a Zeuner diagram which provides insights into the variables and how they affect valve events. Methods of constructing of Zeuner, Reuleaux and Bilgram diagrams is outlined at the SE Lounge website, and a step-by-step procedure for constructing a Reuleaux diagram (as used by Porta for preliminary estimates of valve events) is provided on a separate page. Finally, some mathematical algorithms for estimating valve movements (ignoring angularity distortions) is presented in Appendix 1 of an instructive paper titled Predicting Locomotive Performance written by Prof. Bill Hall. The algorithms can be used for predicting valve openings to steam and exhaust at any position (angle) of the main crank. Note: Jamie Keyte is in the process of developing a steam loco performance simulation package in Excel which he has appropriately named “STEAM” (see separate page of this website). Much has been written about the comparative trials conducted in 1925 between a GWR Castle 4-6-0 and the much larger LNER A1 Pacific 4-6-2 when the diminutive Castle walked away with all the honours, bettering the Pacific in time-keeping and (by a long margin) fuel consumption. The immediate result was the start of a programme of rebulding the A1s into A3s, having higher boiler pressure and long-travel valves which transformed their performance. Yet, the precise advantages that the use of long-travel valves confers has seldom been clearly explained. Lengthening valve travel while keeping lap and lead unchanged, allows the port openings to be lengthened thereby increasing the area through which the steam passes on its way into and out of the cylinder and reducing the pressure drops in both directions. Or, if the port length is unchanged, longer valve travel requires the use of longer lap. Lengthening valve travel also increases the speed that the valve travels, which aids lubrication (even though it is unlikely to achieve hydrodynamic conditions) and also increases the speed with which the valve opens and closes, thereby minimising the amount of “wiredrawing” (and triangular losses) that occur just before the point of closure, and giving more clearly defined valve events. The illustrations below are taken from “Locomotive Valves and Valve Gear” by Yoder and Warren first published in 1921 and republished by Camden Miniature Steam. In the US, the Combination Lever in Walschaerts valve gear is usually called the “Lap and Lead Lever” since its geometry defines the amount of lead that is given to the valve. The amount of valve movement that is derived from the Combination Lever equates to 2 x (lap + lead). Purpose of Lead: Increasing lead is comparable to advancing the ignition on a petrol engine. With positive lead, the admission occurs before the piston reaches dead-centre, thus ensuring that the steam has time to begin applying pressure to the piston as it begins it “power” stroke. High speed steam engines require a long lead whereas low speed freight engines require short or even negative lead. The analogy with petrol engines remains the same. In practice the criterion to be satisfied by lead steam is to aid the obtaining of the least pressure drop between the steam chests and cylinders during the admission phase, and this is generally coincident with obtaining full steam chest pressure in the cylinder at dead centre. This criterion should be satisfied over the widest possible range of speeds and cut-offs. Factors on the 5AT favouring limited lead are as follows. Extremely good internal streamlining at the valves and valve liner ports. Minimal heat transfer from the inlet steam to the cylinder and piston surfaces. Minimal steam leakage past the piston rings and piston rod and tail rod packings. Low clearance volumes for the given level of internal streamlining. Generally low cut-off working (which increases the crank rotation during which the valve is open to lead steam). Minimal slackness in the valve gear, due to the extensive use of roller bearing joints, a very important factor in the ability of the valve gear to deliver the correct motion over a long period of time. Factors on the 5AT favouring long lead are as follows. The necessity to get steam chest pressure in the cylinders at the start of each stroke over the widest range of speeds and cut-offs, which includes at relatively high cut-offs when maximum cylinder power is required for acceleration. The very high coupled wheel rotational speed at maximum train speed, limiting the time for lead steam to enter the cylinders. In the design of the 5AT, Wardale has adopted a lead of 7.0 mm compared to 6.35 mm on the BR 5MT. Porta also explains the purpose of lead in his “Compounding” paper as described in the “Triangular Losses” page of this website. Purpose of Steam Lap: The longer the steam lap, the greater the distance that the valve has to travel in each direction to open the ports at each end of the valve chamber. Long lap valves therefore require “long-travel” valves, which Gresley famously applied to his original A1 Pacific locomotives after the 1925 comparative trials with a GW Castle. for any given cut-off, the length (and area) of port that is opened will be longer thereby increasing steam flow into and out of the cylinder. In the design of the 5AT, Wardale has adopted a steam lap of 65mm thus giving the valve a mid-gear movement of 2 x (lap + lead) = 2 x (65 + 7) = 144mm compared to 98.4 mm on the BR 5MT giving a 46% increase. Purpose of Exhaust Lap: Exhaust lap is not so commonly used as steam lap, the majority of locomotives having zero exhaust lap. shorten the period of exhaust steam flow and thus reducing the draught on the fire. The latter two effects can be seen as having “negative” effects on loco performance, however they can be counteracted by (a) the provision of large port opening (which are in any case necessitated by the provision of a long steam lap), and (b) a good exhaust system that generates high smokebox vacuum from the available exhaust steam. The advanced compression resulting from the provision of exhaust lap is not necessarily a negative effect, since on a SGS design it compensates for the reduced pressure at which compression starts when the exhaust system is improved. Locomotives with improved exhausts may otherwise suffer inadequate compression and consequently require too much lead steam thereby showing significant indicator “triangular losses” at the start of the stroke. During late May 1980 2644 was given an M repair …. and the valve heads were altered to give 5mm exhaust lap with a less rounded exhaust edge. This was motivated principally by the need to reduce the intensity of the draught peaks as a further aid towards improving firebed stability. However a little thought showed that there were other reasons why exhaust lap should be used. 2644 was generally worked at short cut-offs – 25% down to 15% and sometimes even less – at which the release was early, therefore exhaust lap was needed to lengthen the expansion period. During the return stroke compression started from a low pressure due to the improved exhaust, which meant that too little steam was compressed. Advancing the start of compression by means of exhaust lap was therefore also beneficial and it could be stated as a general rule that whenever the exhaust of a locomotive was improved there was a need far increase exhaust lap. In the design of the 5AT, Wardale has adopted an exhaust lap of 18 mm compared to zero on the BR 5MT. Whilst the exact movements of a locomotive’s valves are indeterminate because of the angularity effects of both connecting rods and eccentric rods, a close approximation of its valve events can be found through constructing a Reuleaux diagram in which the angularities are ignored. Porta used these as a first approximation for determining valve events (see his A1 Proposal). 6) Draw verticals from the points where the Admission, Cut-off, Release and Compression lines meet the circle. The distances from the edge of the circle represent the point where each valve event occurs. These distances can be converted to percentages – see below. The clearance volume of a cylinder (often presented as a percentage term) is that part or proportion of the cylinder volume that is not swept by the piston. It is therefore the volume (or proportion of total volume) taken up by the steam passages and cylinder-head cavities – i.e. the volume contained between the piston head and valve port when the piston is at dead-centre. Ideally, the clearance volume should be as small as possible because that part of the steam that fills the clearance volume at the end of each stroke is wasted in that it has done no “work” on the piston. However reducing the clearance volume also necessitates reducing the area of the steam passages which has the effect of restricting steam flow in and out of the cylinder. Furthermore, low clearance volume can result in very high compression that can cause cylinder cover pressure release valves to blow, which is reported to have been a tendency on GW King Class 4-6-0s that clearance volumes of around 6%. A compromise has therefore to be adopted and the clearance volume of most latter-day steam locomotives has been in the order of 10%. In the case of the 5AT with its double-valve arrangement, Wardale adopted a clearance volume of 10.6%. “Fig. 19 (below) shows the influence of the clearance volume: for high boiler pressures it requires prohibitive compressions (thus spoiling the (alpha coefficient) much as happens in compressors. The convenience of a small clearance volume was appreciated early on by Churchward, but his preaching was not understood: he came down to 6% – current engines show 12% and even more in the case of poppet valves. A separate page of this website is dedicated to the subject of incomplete expansion losses. Note: in the case of compound expansion engines, Porta recommends that a relatively large clearance volume be provided in the high-pressure cylinder(s) in order to avoid over-expansion at short cut-off working. He suggests a figure of around 16%, but notes that in the case of his 3-cylinder scheme, he adopts a figure of 35%. In the case of the low pressure cylinder(s) however, clearance volume should be as small as possible, as with single/simple expansion engines. Several pages of this website include text and diagrams copied from Porta’s “compounding” paper, including the pages covering condensation/wall effects, steam leakage, incomplete expansion and triangular losses. More specific references to his theories on compound expansion can be found on the α Coefficient and Compound Expansion pages. Hammer Blow or “Dynamic Augment” is a dynamic force imposed through the driving wheels and onto the railway track resulting from the rotation of out-of-balance weights that are attached to the driving wheels for the purpose of counteracting the horizontal inertia forces resulting from the “to-and-fro” motion of the reciprocating motion parts. Why Are the Main Driver Counterbalances Not Symmetrical? What may not be obvious is that the counterbalances are doing more than simply statically balancing the crank pin, side rods, main rod, and eccentric crank on their respective sides. The main driver counterbalances are “tipped” to provide a force component on one side (eg: left) to cross-balance a rocking couple caused by the opposite (eg: right) side rods and eccentric crank about their own counterbalance weight. This cross balancing renders the axle/driver assembly in dynamic balance as well as static balance. This concept is applicable for all axles, but apparently was done only for the main axle where the additional mass and larger moment arm of the main rod and eccentric crank is much more significant. Additionally, notice that the eccentric crank tips a different direction on each side of the locomotive (when the side rod is down the eccentric crank slants toward the front of the locomotive for normal inside admission valve gear). The main axle counterbalance position takes this into consideration also, contributing further to irregularity of the counterbalance weights. In the context of balance, it should be mentioned also that for this type of two cylinder (single cylinder per side) locomotive, the counterbalance weights balance all of the rotating mass per the above, but balance only a portion of the reciprocating mass. The rotating mass (crank pins, each end of the side rods, back portion of main rod) can be theoretically perfectly balanced with counterbalance weight. However, the reciprocating mass (piston assembly, piston rod, crosshead, union link, bottom portion of combination lever, front part of main rod) cannot be balanced with the driver counterbalances. Any attempt to balance reciprocating mass only results in trading off horizontal unbalance for a vertical unbalance component (overbalance). This overbalance force, referred to as hammer blow, increases with the square of the velocity and is an undesirable characteristic of steam locomotives that was damaging to railbeds and bridges at higher speeds. Wardale, D.W., Fundamental Design Calculations for the 5AT – FDC 8 “Balancing” (unpublished) from which some notes on FDC 8 are published on this website. 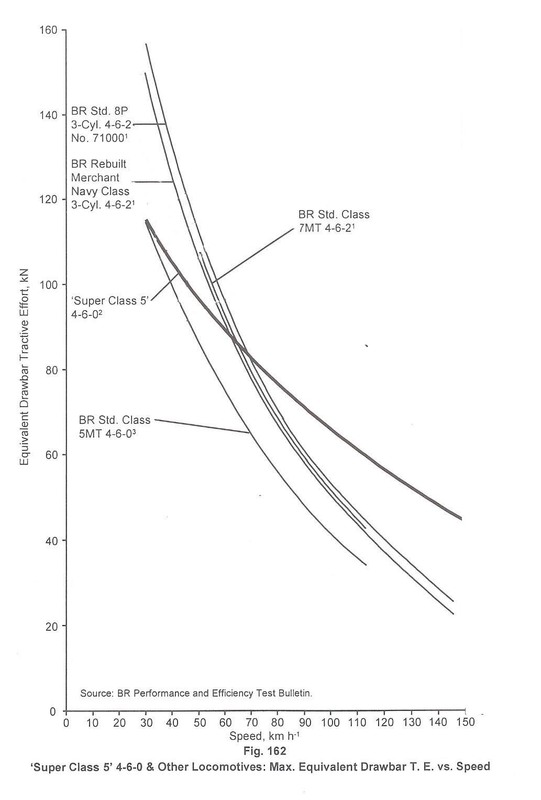 Jarvis, J.M., Balancing of the BR Class 9 2-10-0 Locomotives (transcribed from an SLS journal) – a fascinating account of how the balancing of these remarkable locomotives was worked out with some explanation of balancing techniques and alternative approaches to balancing. Wikipedia’s article on the subject. There are three types of brakes used in railway operations: the Air Brake, the Steam Brake and the Vacuum Brake. Steam Brake (steam locomotives only): steam brakes are used only on steam locomotives and their tenders. Steam brakes use the steam from the locomotive’s boiler to generate the braking force that are applied to the wheels of the locomotive and tender. Automatic Vacuum Brake (heritage trains only): developed in the UK in the second half of the 19th century, the automatic vacuum brake was widely used in the UK and in other countries that adopted British technology, until air brakes became the standard in the late 20th century. Vacuum braking is still used on heritage railways in the UK and on some main line railway systems in Africa and India. Dominic Wells has produced an excellent PowerPoint presentation that describes in great detail the operation of the train brakes. The first part (pages 1 to 205) focuses on Vacuum Brake operation. Air Brakes: the most widely used brake system is the air brake which uses compressed air to generate the necessary force to apply the brakes throughout the length of a train. Air brakes are universally used on modern railway rolling stock worldwide. The second part of Dominic Well’s presentation (pages 206 to 324) describes Air Brake operation. Oliver Bullied, disciple of Gresley and famously progressive CME of the Southern Railway, is often quoted as saying “Thermodynamics never sold a single locomotive” (or words to that effect) when commenting on Chapelon’s contemporary locomotive developments in France. Whether true or apocryphal, the remark exemplifies the lack of understanding of Thermodynamics that was widely prevalent within the locomotive engineering fraternity of his day. Indeed it remains poorly understood by many engineers today, and is a complete mystery to most laymen. The history of thermodynamics [is] not only one of the most interesting but one of the most dramatic episodes to be found in the story of the intellectual progress of the human mind. Starting in an investigation of a purely practical problem of engineering economics, it has grown into a body of doctrine of profound philosophical significance, with consequences which permeate the thinking of men on many subjects, from those with the most practical use to the problems of cosmology. This page and the sub-pages under it, attempt to explain the rather esoteric and abstract concepts that underlie the subject of thermodynamics as it applies to steam traction, using terms that it is hoped will be more readily understood than those found in most texts on the subject. of the heat source and heat sink respectively, measured in oK. It was not until the 1920s that André Chapelon began to apply the theories of Thermodynamics to the design of steam locomotives, with immediate and dramatic results. Unfortunately his work remained poorly understood in most steam locomotive design offices around the world and it was only in the 1950s that Livio Dante Porta took up the mantle and continued the work that Chapelon had started. Important amongst the many lessons that Chapelon (and Porta) learned from Thermodynamics comes from Carnot’s simple equation which explains the importance of high temperature superheat since it shows that an engine’s efficiency is critically affected by its temperature. In the case of a typical “first generation” steam locomotive operating at a superheat temperature of (say) 350oC and with an exhaust steam temperature of (say) 180oC, its theortetical (maximum) Carnot efficiency would be 27%, whereas the 5AT operating at a superheat temperature of 450oC and exhausting at 183oC, its theortetical (maximum) Carnot efficiency is 37%. Third Law – defines absolute zero as equalling -273oC, being the hypothetical point at which energy becomes zero. Alternative Second Law: It is impossible to extract an amount of heat from a hot source and use it all to do work. Some amount of heat must be exhausted to a cold sink. This precludes a “perfect” heat engine. Whilst the laws themselves are simple enough, the interpretation of them leads to complications. Most notably, the Second Law involves understanding the concept of Entropy. The concepts of Entropy and Enthalpy are described in separate sub-pages, together with a brief explanation of what “Steam Tables” are about. However Enthalpy is defined as the sum of a system’s internal energy plus the product of its pressure and volume – i.e. Enthalpy is a “term of convenience” that is useful in the interpretation and application of Thermodynamics. Enthalpy is basically a measure of energy, but its main function is in the calculation and measurement of “flow energy” or gaseous energy (e.g. steam energy). Commonly a “system” may be a combination of solids, liquids and gases, in which case most of its internal energy applies to the solid and/or liquid components while the PV term defines the energy of the gaseous component. This is confirmed by looking at steam tables which show that the enthalpy of water (in its liquid phase) is almost identical to its internal energy. A better defintion comes from mathpages.com which offers the following: “The property that we call entropy is a measure of the uniformity of the distribution of energy”. It goes on to state that the entropy of a system equals the sum of the entropies of its component parts. Fixing the value of any two properties defines the value of all the others. Thus fixing the values of Enthalpy and Entropy is sufficient to define Temperature, Pressure and Internal Energy of the steam. The term “Mollier diagram” (named after Richard Mollier, 1863-1935) refers to any diagram that features Enthalpy on one of the coordinates. Commonly used Mollier diagrams are the enthalpy-entropy (or h-s) diagram (below) and the pressure-enthalpy diagram illustrated at the bottom of this page. The h-s diagram is one in which Enthalpy values form the vertical axis and Entropy the horizontal axis. The values of the other related properties may be superimposed in the form of supplementary curves. red lines give the dryness fraction (in the saturated zone). Ideal (isentropic) expansion is represented on the Mollier diagram by a vertical line. Actual expansion of steam always involves some losses represented by an increase in entropy. In the 5AT FDCs, Wardale gives examples of this, for instance in lines 68 to 84 of FDC 1.3 where he calculates the isentropic efficiency of the 5AT at maximum drawbar power. Here he assumes that the steam enters the cylinders at an absolute pressure of 21.39 bar and temperature of 450oC shown as point A in the diagram below. He then assumes that the steam will exhaust at an absolute pressure of 1.5 bar. Thus an isentropic expansion line AB can be drawn vertically at a constant entropy of 7.254 kJ/K kg, with point B being defined by pressure = 1.5 bar. However in FDC 1.3 line 78 Wardale calculates that the actual exhaust steam enthalpy = 2,803 kJ/kg which allows point C to be located on the 1.5 bar pressure line. Thus the actual steam expansion is defined by the line AC. The slope of the line AC is indicative of the isentropic efficiency of the expansion: the nearer the line is to vertical, the higher isentropic efficiency. Actual isentropic efficiency is determined by dividing the specific work done in the cylinder (FDC 1.3 line 82) by the isentropic heat drop between admission and exhaust (FDC 1.3 line 83). Porta used similar lines in his Compounding paper but has simplified them by omitting all the irrelevant lines from his diagrams. The Pressure-Enthalpy diagram below is an alternative representation of the Steam Tables, where the axes are Pressure (Vertical) and Enthalpy (Horizonatl) and with curves representing temperature (T), entropy (s), specific volume (v), and dryness fraction (x). The dome-shaped curve represents the limits of saturation – within the dome, steam is saturated. Note: The same points A, B and C from the diagram above are illustrated in red. In this case the line of constant pressure (BC) is straight and the line of constant entropy (AB) is curved. Steam tables used to be (and may still be) published in the form of a small booklet listing values of steam temperature, pressure, specific volume (i.e. the volume of 1kg of steam at a given temperature and pressure), specific entropy, specific enthalpy against various input values, separate sets of tables being provided for saturated and superheated steam. SteamTab™ Companion from http://www.chemicalogic.com/ producing outputs for both saturated and superheated steam in either metric and imperial units. Calcsoft.zip from http://www.winsim.com/steam/steam.htmll, a DOS based program that works only in imperial units. However it offers additional functionality that allows entry of steam inlet and outlet conditions in order to calculate power output, isentropic efficiency and various other values. A more challenging and less easily explained anomaly is the fact that at constant temperature, the enthalpy and internal energy of steam falls with increase in pressure. If the same isentropic efficiency (say 85%) is applied to both cases to give a practical expansion allowing for incomplete expansion loss, etc., the relative values always stay the same. The above isentropic expansion from 200 psi gauge to 10 psi gauge gives an exhaust steam temperature of about 131°C, which is still superheated. However the corresponding expansion from 350 psi gauge gives saturated steam at 116 °C and dryness fraction 0.972, hence condensation losses at the end of this expansion would be high. But the entropy rise associated with imperfect expansion acts to increase the exhaust steam temperature for all expansions and hence reduce any tendency for condensation. It is unrealistic to have both expansions start from the same temperature. As the saturation temperature of steam at 350 psi gauge is about 30oC higher than that at 200 psi gauge, if both were superheated to the same temperature the degree of superheat (i.e. the amount by which the superheat temperature is in excess of the saturated temperature) would be that much lower for the former. Rather, as steam at higher pressure would enter the superheater at higher temperature, so the inlet steam temperature at the cylinders would be somewhat higher. This would decrease the tendency for condensation at the end of the expansion. Simply comparing ultra high with normal inlet pressure without specifying the nature of the engine (i.e. simple or compound) is misleading, compound being more suited to the former, simple to the latter. In the case of a compound, the superheat temperature must be set higher as the greater expansion possible in a compound (giving a higher isentropic efficiency, a fundamental reason for compounding) would otherwise result in saturated exhaust steam.